Scan Design, a Scandinavian furniture store that has been in Honolulu for years, is closing soon. Here, shoppers lined up to take advantage of the close-out sale yesterday. Expect to stand in line at Scan Design, the European furniture store that is closing its doors after 29 years of doing business in Hawaii. Since word got out, hundreds of customers have been swarming the 36,000-square-foot store at 788 S. King St., hoping to score a deal on the close-out sale that started yesterday. By 10 a.m. there was already a line snaking halfway down the street toward the Straub Clinic. The earliest customers arrived at 6:45 a.m. Dozens were turned away at the door yesterday afternoon, as Scan Design was already filled to capacity. The store is only allowing repeat customers who received an invitation letter to shop escorted by a sales representative. Customers who just wanted to go in to look around were not allowed. Scan Design will be open from 10 a.m. to 5 p.m. Wednesdays through Sundays, but given the crowds, you might want to get there early. Expect to spend some time in line to get inside, and then to get to the sales desk. "There's been such a huge response," said Ray Mahan, president of Scan Design Furniture Inc., who personally manned the front door. Mahan wanted customers to know he appreciates their support but that they need to be prepared for a long wait, sometimes between two to three hours or more. Throughout the day yesterday, he had customers coming by to say how much they will miss Scan Design and how they wish it was not closing in Hawaii. Many had been customers for 10 years or more. While he appreciates those sentiments, the economic reality of skyrocketing costs was what prompted the company to shut down here. Scan Design was hit with a triple whammy. "Ultimately, it's the rent increase overall, the increase in freight rates and the drop in dollar value," said Mahan. "We know it costs more to do business here, but it's just that the costs have gotten so high." Scan Design faced rent increases at both its warehouse and retail store, while the weaker dollar resulted in losses importing furniture here from Europe. Add to that the higher cost of transporting the goods to Hawaii, and it just did not make business sense anymore. Founded by Denmark immigrant Jens Christensen Bruun in 1964 and now headquartered in Lynnwood, Wash., Scan Design has established a reputation for offering creative and contemporary furniture with simple, clean lines. The first Hawaii store opened on Beretania Street in September 1979, and then later moved to the King Street location after merging with Scan Line Office Interiors. The newer location has some challenges. There are just a few parking spaces squeezed in front of the store on a busy one-way street. But it has a loyal customer base willing to drive there - 16,000 letters went to repeat customers informing them of the close-out sale. Mahan said the Scan Design in Honolulu was one of the higher-volume stores in the company, though he declined to disclose revenue. Three stores in Washington and four stores in Oregon will remain open. The Sand Island warehouse is still stocked with furniture, which will be transferred to the store. Mahan estimated liquidating all inventory in Hawaii will take up to another month or so. Sixteen employees at Scan Design will lose their jobs, although some have inquired about transferring to the mainland stores, he said. New furniture stores, such as the Honolulu Design Center (home to Inspiration Furniture) on Kapiolani Boulevard were not a major factor in Scan Design's closing. "We have our own niche and don't carry the same products," said Mahan, who considers competition healthy. 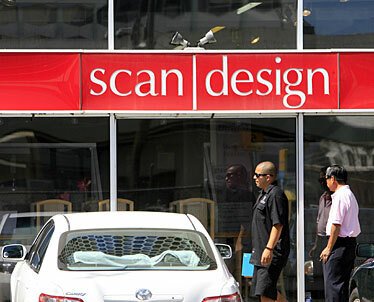 Mary Roberts-Matsuo, an East Honolulu resident, was particularly disappointed to learn of Scan Design's closing. The former Washington resident said she was a loyal customer even before she moved to Hawaii in 1995. Her entire home is outfitted with Scan Design furniture, which she says is of a good enough quality to pass down the generations. "I love this brand of furniture." she said. "I think it's like another icon leaving the island." Would Scan Design come back to Hawaii? Sure, said Mahan, if the circumstances were right. If the dollar grew stronger, for instance, and lease rents were more competitive, he would definitely consider returning to Hawaii.